Ayyanar Falls are located 10 km (6.2 miles) west of Rajapalayam town and municipality in Virudhunagar in the Indian State of Tamil Nadu. Ayyanar Falls are a part of the eastern slopes of the Western Ghats of the south. The source of water to these falls is the monsoon rains in the region. The water of the cascade is believed to be very pure and hence used by the nearby villages for drinking purpose. These waters are also used for irrigation in the surrounding areas, by the local farmers. The area near the Ayyanar falls is ideal for woodland mountain climbing for the tourists. The name Ayyanar is given to these falls because there is a small forest temple named Ayyanar Temple beside the falls. 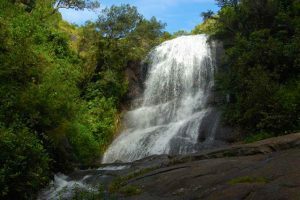 The falls are maintained by the Department of Forest, Tamil Nadu and by the Rajapalayam Municipality. Located in lush woodlands, Ayyanar Falls is a delightful place to enjoy the magnificence of nature. Located on the eastern slopes of the mighty Western Ghats, trekking to these falls will give you a great opportunity to enjoy woodland mountain climbing. You will need permission from the Forest Department to trek to Ayyanar Falls. The ascent to the falls will take you about three hours. The forest is home to the Grizzled Squirrel and Varaiyadu Goat, so it is a protected area. It is recommended that you return before sundown as the forests are home to wild elephants. 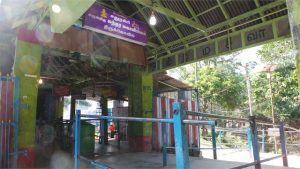 Srivilliputhur Andal Kovil is a popular – old Hindu temple and one of the 108 Divya Desams of Lord Sri Vishnu. To the devotees and vaishnavites, Srivilliputtur is synonymous with Lord Vishnu, Periyalwar and Andal. 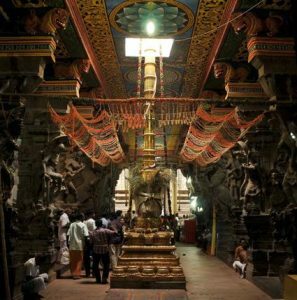 It is an interesting place to any aesthetic person for enjoying the sculpture and ancient drawings in the temple. It gave –‘Thiruppavai’ of Andal and ‘Tirupallandu’ of Periyalvar- the hymns on Lord Vishnu to Tamil Literature. These Tamil hymns – Tamil Vedam-Alwar pasurams- are recited everyday at this temple. 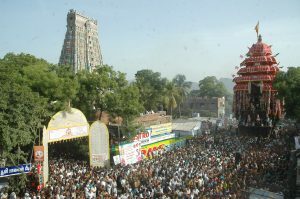 Thousands of people from the state participate in the “Aadi Pooram” festival celebrated in the Andal Temple. After early morning special pujas, the presiding deities, Sri Rengamannar and Goddess Andal are taken in decorated palanquins to the car. The festival marks the adoption of presiding deity, Andal, by Periyazhwar after he found her near a Tulsi plant in the garden of Vadabadrasai Temple at Srivilliputhur on the eighth day of the Tamil month of Adi. Sathuragiri Hills or Chathuragiri otherwise known as Sundara Maha Lingam is situated 10 kms from Watrap (Vathirairuppu) near Srivilliputhur. The name Sathuragiri came from Chathur (4) Veda (Vedas) Giri (Hill), where all the four Vedas met and formed the hill. Another meaning is that the whole mountain is in square (Chathuram) in shape so the name Chathuragiri. Sathuragiri is the Abode of God. It is otherwise also called as Mahalingam Hill. This is also called as “Siddhargal boomi”. 18 Siddhas were said to live here. This is a mysterious hill where it is believed that Siddhars still worship the lord Shiva. Public are allowed only Six days in a month, 3 days each during New Moon & Full Moon days (i.e. Day before & Day after, with Full moon or New moon days). Devotees should not pollute the water source. It is better to avoid plastic covers and water bottles in Sathuragiri Forest. For the first time, it takes nearly 4 to 5 hours to climb to the Top of the hill. Rest, can reach the top within 2 to 3 hours. On the hill there is no electricity, W L L telephone connection available (BSNL), getting BSNL cell phones only. We can find few numbers of shops selling buttermilk, coffee, snacks, etc. During some days like full moon day, new moon day and other festive seasons Annadhanam is served to the devotees from morning till evening near both the temples and stay in the shelter provided there before dark falls. Basic amenities are provided at the hill.